A 2018 report by GAO (Government Accountability Office) in the US uncovered very shocking statistics about the sale of counterfeit products online. The report revealed that major e-commerce sites including Amazon, Walmart and eBay could be selling a substantial number of fake products online. The survey conducted showed that 20 products out of the 47 products bought online from the top sellers were fake. This is slightly more than a third. The GAO findings state that the major counterfeiting problem was posed by third-party sellers. Another recent survey by LocalCircles revealed that up to 38% of respondents have bought fake products online from top online retailers in under 6 months. Most recent surveys seem to agree that at least a third of products sold online could be fake. This is indeed a global problem and wherever online shopping is done, consumers need to be aware. So, how should you protect yourself as a virtual shopper? This is a very important question. First, you need the right information about fake or counterfeit products. What are they? What harm do they pose? What can you do to avoid buying fake products online? The following resource seeks to answer all the questions raised above. What are counterfeits or fake products? Counterfeits literally mean imitations or replicas. In most cases, these replicas are not authorized. In this respect, instead of buying an original product, you get a fake or an imitated version. The intention of counterfeits is to benefit from the value of the original high-quality product. All manner of products can be counterfeited ranging from clothing, shoes, handbags, drugs, watches, electronics to art, toys and software; the list goes on and on. Fake products will have logos and brand identities that have been acquired illegally. This falls under trademark infringement. Why are counterfeit products bad? First, when you buy an imitation, the quality is low and you will not enjoy the full merits of the original product. In this case, fake products will have you spend money on poor quality products. This is fraudulent to say the least. Fake products have an adverse effect on businesses. This is because counterfeits will lead to loss of revenue for the genuine brands. In this regard, hundreds of millions are lost in revenue for companies owing to the trade of fake products. Fake products also pose a great health risk to consumers. Many will contain harmful toxins like lead and waste matter like rat droppings. Fake products like electronics may also be fire hazards. Medicines that are fake have led to loss of lives. Through the Internet, those who are in the counterfeiting trade tend to thrive. This is because it is harder to regulate where quality assurance is concerned. These are just the major effects of the counterfeit trade: there are many others. For every product you buy online, there is a chance of it being counterfeit. Therefore, you must always be vigilant every single time. The following surefire tips to guide you accordingly. There are numerous e-shops to find online. Know the identity of your preferred online seller. Getting their details will help you when you want to complain and so on. Therefore, verify the name of the company, their physical address, their online contact forms or email, as well as their phone numbers and even fax where necessary. Many briefcase online shops will thrive selling fake products; it is your duty to get some in-depth information about these sellers before you order. When an e-shop has been trusted by many, they might receive marks of quality or trust marks from third parties. This helps shoppers feel safe while shopping on the platform. Depending on your location, look out for any marks of quality awarded to the online retailer. Also, check out the information about the body that has issued the trust mark. This helps you in learning more about the types of products sold and the quality therein. Many trusted online shops will go an extra mile to assure their customers in this manner. If a web-shop has an overwhelmingly positive customer review base, chances are that those reviews are not genuine. You should look at the objectivity and the actual elements raised in the reviews. Genuine shoppers will talk about their experiences and products in a believable manner. Also, there will be no obvious pattern of review postings where real consumer reviews are concerned. Therefore, take time to look at what others say about the products you wish to buy and make an informed decision. Those who deal in fake products are indeed unprofessional. When it comes to their online website interfaces, this will easily reflect when you scrutinize them accordingly. The sites might contain many grammatical errors and spelling mistakes. The pictures could be limited or of very poor quality. The means of payment may also be poorly laid out and unprofessional. All these are red flags when buying online. Also, be careful about web-shops that brand themselves as cheap. This is always an indicator of people who want to sell fast with little regard to quality. Go with your gut feeling whenever you see something unprofessional on an eCommerce site. Product brands in their official websites will have a list of all authorized third parties who sell their products. In this regard, it is easy to know whether you are buying an original product or not. Visit the official brand website and if the information is not provided, engage them and inquire about the right online outlets for the products you are buying. You may even discover some black-listed sellers listed on the official brand site. Therefore, some due diligence goes a long way to averting fake goods. Fake products online can be easily identified when you consider the information provided. Some web-shops will have scanty or low quality pictures. In addition, in-depth information about products could be limited or unavailable. Some products will have generic specifications. This should alert you about possible counterfeit products. Genuine products will have satisfactory information and product pictures as required. Fake products are naturally sold at a lower price. If the online seller proposes a price that is too good to be true, chances are that the product is fake. However, you have to be objective when considering prices. Look at the cost of delivery, VAT, custom duties among others. Compare prices with other virtual sellers and note the difference. Check out the brand official site and see the price difference. Counterfeit products many times are sold at throw-away prices. Therefore, looking for a bargain is great but very cheap can be substandard. Product warranty and trial periods are very important when it comes to evading fake products online. Therefore, only use web-shops that have a clear policy that protects you as a consumer. With a trial period, you can return the fake product and get your money back. Some online shops will allow you to pick another product in cases of damage. All in all, return policies should be clear for the consumer. Secure websites are those that have a key logo or padlock displaying beside the URL. These are sites whose address begins with "https". Avoid shopping at sites that require you to pay through online money transfer systems. Using a credit card means that you can recover your money from the credit card company where fraud is evident. Some people will use escrow systems to pay for major online purchases. This means that the seller only gets the money once you are happy with the quality of product received. Refurbished products are many times mistaken for counterfeits of imitations. They are simply used products that have been repaired by the manufacturer and sold again to the market. They are normally cheaper than original new products. When buying, consider their price and which company they are from. Of course, some online sellers may claim to sell refurbished products but in actual sense they are fake. Some due diligence about the products will be in order. - The most counterfeited products in the world are clothing, consumer electronics, footwear, watches, jewelry, handbags, wallets, perfumes, cosmetics, toys, medical equipment, pharmaceuticals, DVDs, CDs, computers, labels or tags, automotive and aerospace parts. 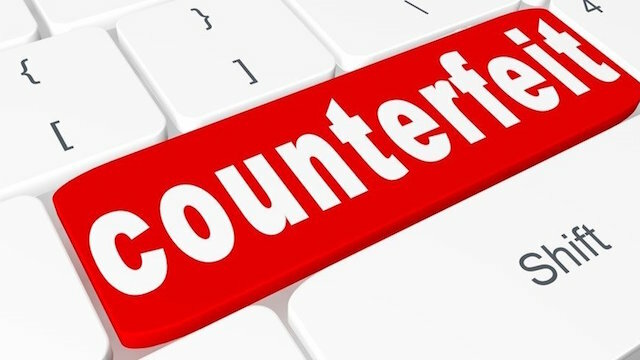 - According to the Organization for Economic Co-operation and Development (OECD) and the European Union Intellectual Property Office (EUIPO), the counterfeit products market is huge with a worth of at least $461 billion. This criminal activity ranks above prostitution, marijuana sales, illegal gambling, cocaine and heroin sales, oil theft and human trafficking. These crime sectors are not worth more than $200 billion each. Therefore, the fake products industry is booming. - In 2011, up to 22 fake Apple iStores were operating in China. While in 2013, the most counterfeited brand was Nike and Apple was second. - The International Chamber of Commerce estimates that up to 2.5 million jobs have been lost due to the counterfeit products industry. - The World Health Organization estimates that 30% of all medicines in developing countries are fake. In 2011, over 60% of anti-malarial drugs imported in Nigeria were fake. - Thailand has a museum featuring counterfeit goods and it is called the Tileke & Gibbins museum. Thousands of visitors tour the museum each year. The museum seeks to raise awareness and educate people about fake products. They display fake goods alongside real ones to show the difference. Was this article helpful? Then share it!